Elizabeth Mayor J. Christian Bollwage (3rd from left), Union County Freeholder Chairman Sergio Granados (3rd from right), and Groundwork Elizabeth Executive Director Jonathan Phillips (2nd from right) joined with Elizabeth seniors and staff of the Peterstown Community Center and Groundwork to plant a new waist-high “senior” bed with fall crops. Credit: James Lowney/County of Union. Union County, NJ – Seniors at the Peterstown Community Center in Elizabeth celebrated the delivery of a new waist-high “senior” garden bed earlier this week, with the help of Elizabeth Mayor J. Christian Bollwage, Freeholder Chairman Sergio Granados, Groundwork Elizabeth Executive Director Jonathan Phillips and others. The new bed was funded through a grant from the Union County Means Green Community Garden Grants program. The senior bed was built and installed by staff from Groundwork. The raised height and slanted sides of the new bed enable seniors and people with disabilities to enjoy gardening from a standing or sitting position, rather than bending or kneeling. Groundwork staff also provided seniors at the Peterstown Community Center with a gardening workshop, demonstrating how to plant the new bed with lettuce and radish seedlings for a fall harvest. The senior bed joins a sprawling layout of garden beds already established at the Peterstown Center, located at 408 Palmer Street. This year the garden yielded a bumper crop of fresh eggplant, tomatoes, basil, kale and much more. The Union County Means Green grant program began in 2016 with the aim of introducing the benefits of community gardening to residents throughout Union County, including fresh produce, educational activities, recreation and community service. 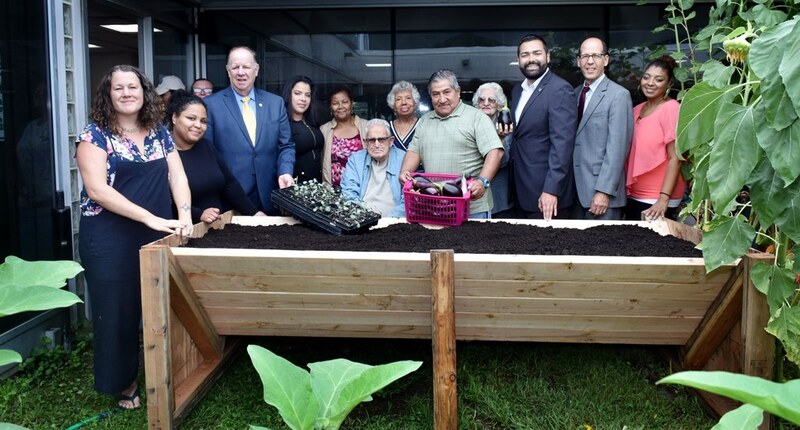 The program is funded by the Freeholder Board and administered by Groundwork Elizabeth as part of the organization’s “Come Grow with Us” community garden network. The Freeholder Board also supports the Master Gardeners program, which trains and certifies members of the public to provide gardening guidance and activities for their communities. The program is run by the Rutgers Cooperative Extension of Union County, with offices at the Union County complex in Westfield and a large demonstration garden in Mountainside. The next Master Gardeners training session is coming up this fall. Any Union County resident can join, regardless of experience. For more information visit the Extension online at ucnj.org/rce or contact Tamisha Hopkins at thopkins@ucnj.org or 908-654-9854, extension 2. For more information about Groundwork Elizabeth and Come Grow with Us, visit online at groundworkelizabeth.org, call 908-289-0262, or email elizabethnj@groundworkusa.org.